"The Memory Card" is a seasonal feature that dissects and honors some of the most artistic, innovative, and memorable videogame moments of all time. Online multiplayer is revolutionary. The fact that almost every console offers you the chance to play a specific videogame with almost anyone in the world at anytime is a pretty remarkable step forward in terms of both technology and player interaction. There is no denying the birth of online multiplayer changed videogames forever. 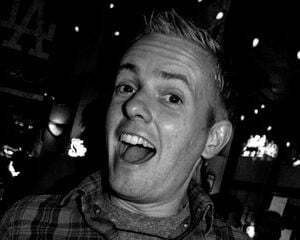 While I still play games online and admire how its creation affected the industry, I am an old school kind of guy (translation: retro snob) and long for the days when friends got together and played videogames in the same room. I love it. I love it so much that I try to do it as much as possible (thank you, Rock Band and Wii Sports Resort). This is why I still play and worship Contra for the Nintendo Entertainment System. Even though you can play it online through Xbox Live Arcade, nothing -- and I mean, nothing -- will ever beat sitting next to a buddy and enjoying the genuine camaraderie that fills the room as you laugh and curse your way through the game’s ridiculously tough stages. Hit the jump to relive my favorite multiplayer moment from Contra -- actually, maybe my favorite multiplayer moment of all time. A moment so classic, so nostalgic, so maddening ... that it can only be truly appreciated with a good friend by your side. I am assuming if you are reading this you already know a lot about Contra. If you don’t, well, maybe we need to have a little talk about setting some priorities in your videogame world. Mainly, Contra should be your number one focus and nothing else matters! Pretty simple priority list, huh? Initially released as an arcade game in the most-likely-before-a-lot-of-you-were-born year of 1987, Contra did not find its full popularity until it was ported to the Nintendo Entertainment System a year later. And, boy, did it become popular. To this day, many people consider Contra one of the greatest (and hardest!) action games ever created. In the game, you play as either Bill or Lance, two soldiers set to infiltrate the island of Oceanian in the hopes of destroying an alien force and helping save the world! But the story of Contra is not what makes the game so memorable. 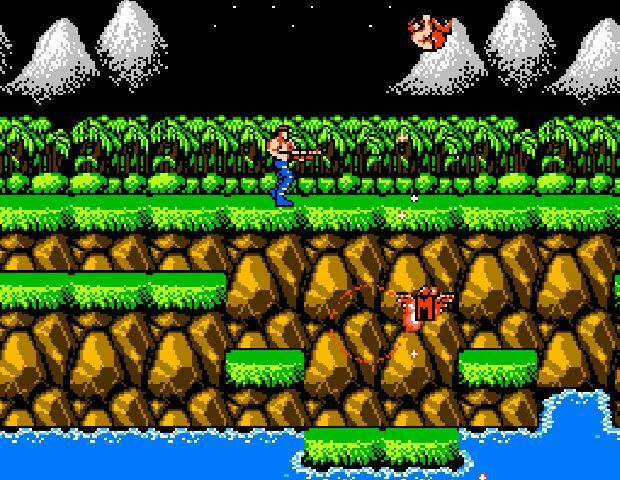 Besides the challenging difficulty level and epic bosses, Contra made a mark on the world by offering revolutionary two-player simultaneous gameplay -- something almost never seen in videogames of the ‘80s. By selecting “2 Players” on the main title screen, both Player One and Player Two enter the first level at the same time. From this point on, both players journey through the game’s multiple levels together. Although you can work together to shoot enemies and defeat bosses, you also have to learn to share weapons -- usually not a problem until that much coveted Spread Gun appears on the edge of nearby platform. While the game thankfully adds a feature that prevents you from hurting each other with the destructive in-game weapons, there is one aspect of the multiplayer both loved and hated by all that have played it. 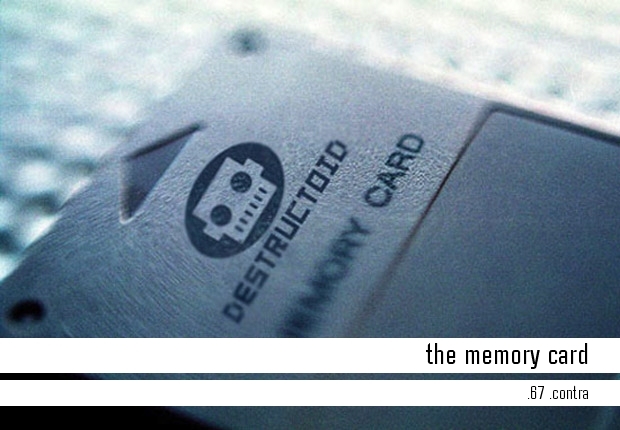 It is this surprisingly memorable -- if for all the wrong reasons -- feature that is the focus of this week’s Memory Card. In modern co-op multiplayer side-scrolling videogames, technology allows the camera to zoom out and allow more “breathing room” for the players on-screen. If one player wanders too far ahead or, conversely, falls too far behind, the viewpoint will adjust for this by zooming out and showing a wider view of the action. Unfortunately, the ability to do this did not exist in the 1980s. 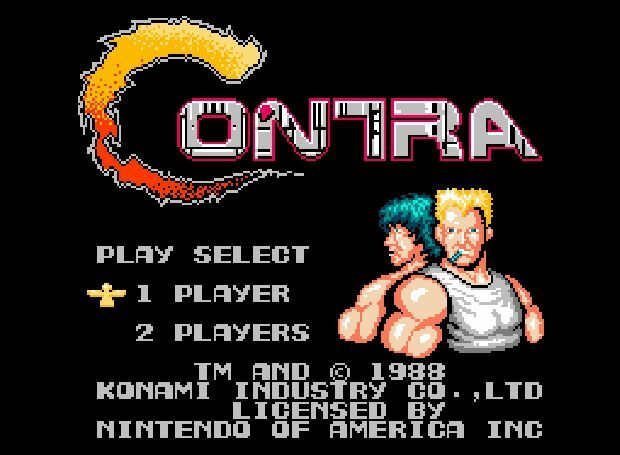 In Contra, the camera always stays static, only scrolling ahead once both players move forward. On horizontal-scrolling levels (which the game is mostly compiled of) this is not a big deal -- only offering the occasional issue with keeping up during some tricky jumping sequences. But then Stage 3 comes along. 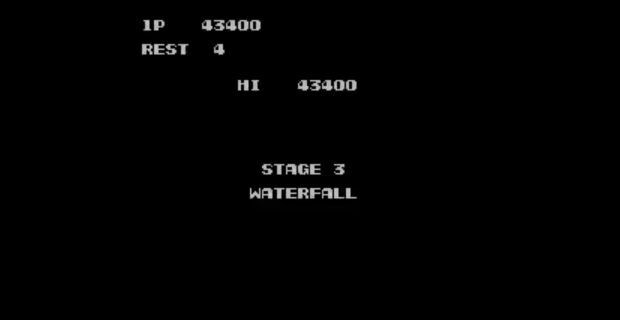 Stage 3 is the “Waterfall” level, and, as most of you reading this are probably starting to remember, playing it with two players is somewhat of a nightmare. An awesome, memorable, entertaining, infuriating nightmare. Basically, Bill and Lance must make it to the top of a vertically-scrolling level, completing a series of very challenging jumps, all the while avoiding falling boulders and flying projectiles from enemy soldiers. By itself it is already a tough level, but then you factor in both players trying to do all of this at once and the result is far from simple. As I mentioned before, the camera only stays in one spot until both players reach a place in the screen that will allow the viewpoint to move forward. Because of this, there are numerous occasions when one player will fall behind. This would not be such a big deal if it were not for the fact that LEAVING THE SCREEN AUTOMATICALLY KILLS YOU! Since Bill and Lance jump so high, when one player jumps to make a hard-to-reach ledge, the bottom of the screen will catch up with the other player, usually resulting in the platform he/she is standing on to disappear. When this happens, the player falls off the screen below and dies instantly. To make matters worse, when Bill or Lance respawn, they appear either at the very edge of a lower ledge, or completely over the top of another bottomless pit caused by the other player constantly moving up through the level. Needless to say, the entire level is chaos. Here's a common scenario: After dying numerous times in a row, you yell at your friend to stop moving forward. When that happens, a boulder falls down and kills your friend since he stopped to wait for you to catch up. This death causes you to be thrown off and you fall down a pit. Your friend then keeps moving forward to avoid all the craziness on screen, only to have you die over and over again, since your solider keeps respawning at the bottom of the screen and over a hole between two platforms. Without constant concentration and communication amongst the real-life players, there is almost no way of making it through the waterfall level without losing all your lives. The mayhem is totally classic. 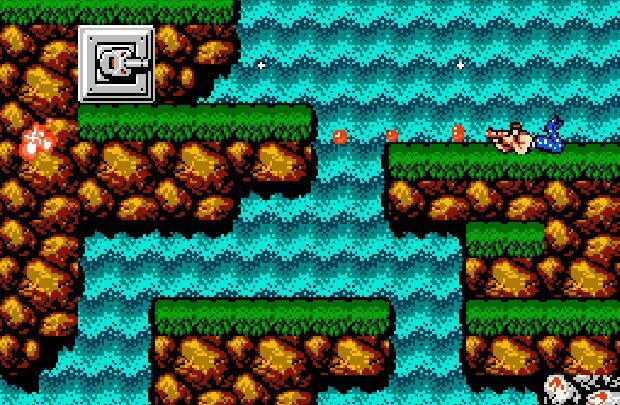 There are many different stages in the Contra series that result in this same gloriously frustrating experience, but the waterfall level was the first and easily the most memorable. I consider myself a Contra expert, but even to this day I still get tripped up to the point of pulling out my hair when I reach the waterfall level with two players. I can breeze through it by myself, but once you add that second player everything just gets out of control. But that is the beauty of the game and the sole reason the waterfall level is so memorable. 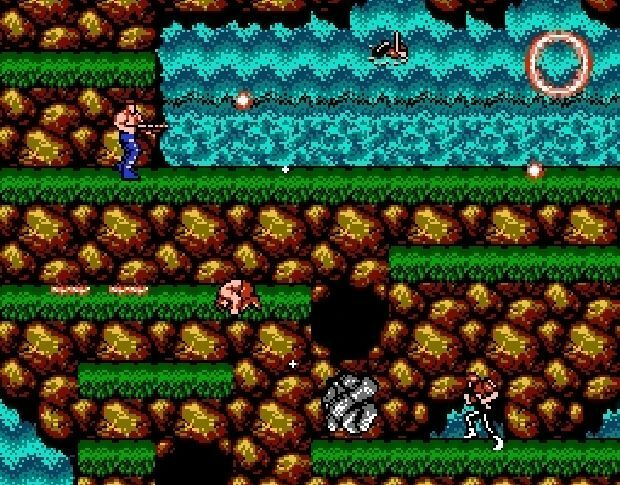 Contra is one of the first games to introduce such a deep level of co-op multiplayer action. Not only do you have to work together to beat the game, you have to constantly be talking with your friend and concentrating on what they are doing to ensure safe passage through each level. How many times do you remember looking over at your friend and actually counting to three before both of you try to make a tricky jump, only to physically shove them the next minute in order to grab a helpful power-up first? It is this continuous dance of cooperative and competitive gameplay that makes Contra such a brilliant creation. The waterfall level is the very definition of what makes playing a videogame with friends in the same room so fun. The laughing that happens when you accidentally kill your friend for getting too far ahead slowly turns into anger when you start to do it on purpose once you realize how much fun it is to watch your partner die instantly the moment they respawn. I’m telling you: I am not evil when I play multiplayer games at all, but the waterfall level in Contra brings it out in me! I love racing ahead and watching as my partner tries to catch up and evade death! Does that make me a bad person? Even better, if you get two players who are equally skilled, the race to the top of the waterfall becomes super intense, with both players silently concentrating to avoid being the first person that dies. Once you die first in the waterfall level it is pretty much all over. 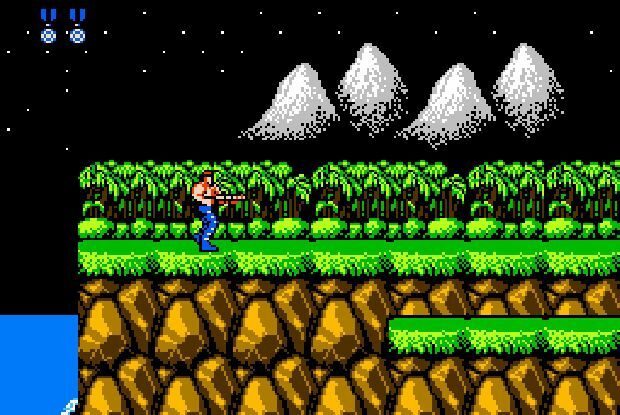 Think back for a second and think about how much fun it was to play Contra with a buddy sitting on the carpet in front of the television with an NES controller in hand. The tension, laughing, and cursing that happened during the waterfall level are one of a kind and really can’t be duplicated in the online multiplayer matches of today. It’s just not the same. I am not complaining about online multiplayer -- it obviously has its advantages -- I just miss the good old days when multiplayer involved you, a few friends, and a Nintendo Entertainment System. The waterfall level in Contra is the perfect piece of videogame nostalgia.